The Cook's Broth.... HAS MOVED TO: andyoliverchef.com: Wing beans! Wing beans - they're beans with.... errr wings. ...Green Papaya - a Vietnamese restaurant on Mare St (in Hackney) introduced them to me. I ate there with a few friends and the wing beans along with a crisp smoked tofu number were, unexpectedly, the most popular dishes on a well packed table. I was doing some Asian food the other night and thought I'd do my own rendition of the dish. I wasn't certain what Green Papaya used i settled on dressing them with Chinese black rice vinegar, light soy, pinch of sugar and some roasted sesame oil and then scattering with toasted sesame seeds. 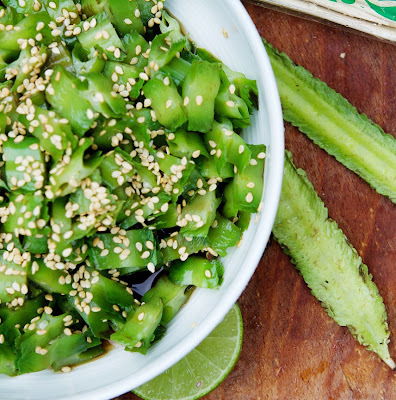 Very easy, but it came out how I'd hoped: crunchy interesting beans with sharp, salty, & slightly sweet sesame dressing. Dressing: 2 tablespoons of Chinese black vinegar, 2 tablespoons of light soy sauce, 1 teaspoon of toasted sesame oil, 1 teaspoon white sugar & 1 teaspoon water. Blanch the beans in salted boiling water for 2- 3mins, drain and then briefly refresh under cold running water (just a few seconds - so the beans stay warm but don't continue to cook and loose their bright green colour). Mix the dressing ingredients together, taste and adjust if needed, then toss the warm beans in the dressing and finish with sprinkled toasted sesame seeds. Would go well alongside many Chinese style dishes e.g some ginger-spring onion-soy steamed fish thing, or a slow braised hot pot (i.e rather than with something like a coconut based curry). just curious, I think wing bean is quite common in Thai cooking, but it is not used in David Thompson's kitchen? Wing bean salad , i always scoff it in Bangkok...Fantastic , spicy served with peanuts , coconut cream and river prawns.Must get some seeds next time im there. pofu - yeah i know funny isn't it. am sure they've been on the menu at nahm before but strangely not in the 18 months I've been there. think there's a recipe or two for them in DT's book. alan - that sounds damn good, will search a plate out on my next visit to bkk.